Neobladders and bladder augmentations are being performed with increasing frequency. Obviously, there is an enormous need for bladder replacement tissue. The gastrointestinal segments that are currently used lack the physiologic and mechanical properties of urothelium. While gastrointestinal tissues are designed to absorb specific solutes, the urothelium is designed for urine storage, not the transfer of electrolytes. Despite the acceptable functional results of enterocystoplasty and orthotopic neobladder, numerous complications can arise from the combination of intestine (with its associated heterotopic epithelium) and the urinary tract (7). Metabolic, infectious, and calculus complications, as well as the morbidity associated with enteric surgery have driven numerous investigators to explore the use of alternative materials and tissues for bladder replacement or repair. The success of using cell transplantation strategies for bladder reconstruction depends on the ability to use donor tissue efficiently and to provide the right conditions for long-term survival, differentiation, and growth. Numerous nonenteric biological and synthetic materials have been used for bladder augmentation and bladder replacement in animal models. A variety of complications have occurred with the use of synthetic materials that have limited its widespread use (8). Tissue engineering with selective cell transplantation is a feasible strategy to create new, functional bladder tissue (9). 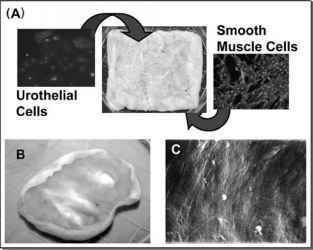 Using cellular tissue engineering, composite bladder tissue of urothelium and muscle cells can be expanded in vitro and seeded onto a polymer scaffold, generating sheets of cells (4). Other early experiments demonstrated that the engineered bladder tissue implanted into mice formed composite tissue with layers of muscle cells lining multilayered epithelial sheets. To test the effects of implanting engineered bladder tissue in continuity with the urinary tract, an animal model was used. Subtotal cystectomies were performed in dogs (1,10). Urothelial and muscle cells were separately expanded from an autologous bladder biopsy. A collagen-based matrix derived from allogenic bladder submucosa served as the vehicle for cell delivery. The augmented bladders demonstrated cellular organization consisting of a tri-layer of urothelium, submucosa, and muscle. Radiographic and urodynamic studies revealed compliant, large-capacity bladders. An average bladder capacity of 95% of the precystectomy volume was achieved in the tissue-engineered bladder specimens (Fig. 1). Laparoscopic bladder augmentation is being done in humans (11); however, laparoscopic bladder augmentation with engineered tissue has only recently been described in animal models. FIGURE 1 ■ (A) The native canine bladder prior to trigone-sparing cystectomy. (B) The engineered neo-organ is anastomosed to the trigone. (C) The implant, decompressed by a transurethral and suprapubic catheter, is wrapped with omentum. Nonetheless, this animal study demonstrated that laparoscopic bladder augmentation with engineered tissue is technically feasible, and can be performed safely in a large animal model. Clayman and coworkers developed a laparoscopic technique for augmentation cystoplasty with engineered tissues in minipigs (12). The animals underwent successful laparoscopic partial cystectomy and closure with patch augmentation utilizing various free grafts (acellular) materials. Cell-seeded graft materials were not used in this study. Laparoscopic partial cystectomy was first performed through a transperitoneal approach. The excised bladder specimen was measured and a biodegradable patch twice that size was used. Four Vicryl corner sutures were placed to assist with intra-abdominal orientation and fixation to the bladder wall. The patch was placed into the abdomen through one of the 12 mm ports and oriented to the bladder wall by aligning the four preplaced sutures with the corners of the bladder defect. The corners were secured with an absorbable Lapra-Ty clip, and the anastomosis was completed with an EndoStitch with 4-0 Vicryl sutures. The bladder was drained with a urethral catheter for one week. Mean operative time was three hours, and blood loss was minimal in all cases. Two of 31 pigs had post-op complications— one control animal had an anastomotic leak, and one animal with a human placental membrane patch developed a leak in the patch. The majority of the augmented bladders contracted over time, because the scaffolds were acellular, and not seeded with cells. Recently, Clayman and coworkers in collaboration with our research team, have performed total bladder replacement with allogenic bladder submucosa coated with urothelial and detrusor cells (13). Five minipigs underwent neobladder creation with acellular bladder submucosa, while 10 minipigs underwent bladder replacement with bladder submucosa coated cells. All surgeries were performed with laparoscopy. All animals were evaluated with urodynamics, radiological studies, and serum chemistry pre- and postoperatively. The bladder submucosa coated cells was prepared from hemicystectomy specimens obtained from the test animals laparoscopically. Urothelial and muscle cells were cultured using previously described techniques, and expanded separately. The urothe-lial cells were seeded on the luminal surface of the acellular bladder submucosa, and muscle cells were seeded on the opposite side. The grafts were then fashioned into a neobladder and implanted into the animals after a total cystectomy. FIGURE 2 ■ Tissue-engineered neobladder. (A) Tri-layer grafts of host urothelial and detrusor cells seeded onto bladder submucosa. (B) Acellular collagen matrix (after cell seeding). (C) Electron microscopy of cellular collagen matrix (after cell seeding). The creation of a neobladder using engineered bladder tissue and laparoscopic techniques is technically possible. Genetically identical renal tissue has been produced applying the principles of tissue engineering and therapeutic cloning in a large animal model, the cow (Bos Taurus). placement of a JJ (double-J) ureteral stent. Four pigs had the ureteral anastomoses performed using the "dunk" technique. Two small openings were created at the dome of the bladder submucosa coated cells prior to its placement into the abdomen. One of the mobilized ureters was placed through one of the openings and out of the other. The medial surface of the ureter that entered and exited the neobladder was sewn to the medial surface of the contralateral ureter and then gently pulled until both urteral orifices were inside the bladder submucosa coated cells graft. Each ureter was fixed to the exterior of the neobladder with sutures. This technique precluded the use of stents. Any leaks in the neobladder after closure were closed with 4-0 Vicryl. Omentum was mobilized to cover the neobladder in six pigs. All procedures were successfully completed laparoscopically. Over time, bladder capacity decreased in both the bladder submucosa coated cells and acellular bladder submucosa groups, but more severely in the acellular bladder sub-mucosa bladders. The mean survival for acellular bladder submucosa and bladder sub-mucosa coated cells bladders was 52 and 65 days, respectively. One animal in the bladder submucosa coated cells group died on postoperative day 2 secondary to leakage at the bladder dome and urinary ascites. The remaining deaths were due to progressive uremia requiring euthanasia. Small contracted bladders with bilateral hydroureteronephrosis were noted on autosopy studies. 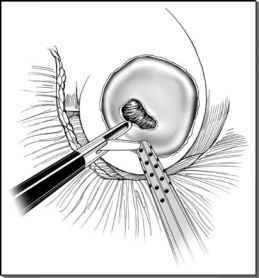 The urethral anastomoses were narrowed but patent in both bladder types. There were no appreciable differences with regard to ureteral implantation in the end to side or dunk technique. Cystoscopic examination of the bladder sub-mucosa coated cells grafts appeared endoscopically similar to normal bladder with gross appearance of submucosal and surface vessels. All reimplants were patent but somewhat narrowed; each demonstrated reflux on cystograms performed before animal sacrifice. While more advancements in technology are needed before this approach is clinically applicable in humans, this attempt may represent the future of tissue engineering and laparoscopy.